These Chocolate Peppermint Cookies are for the peppermint lover! 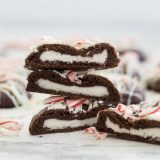 A peppermint patty hides inside a soft chocolate cookie. Drizzled with white chocolate and crushed candy, this cookie is dressed up for the holidays! Combine the flour, cocoa powder, granulated sugar, brown sugar, salt, and baking soda in the bowl of a stand mixer. Add the butter and beat until combined. Beat in the egg. Lay out a large sheet of plastic wrap. Turn the dough out onto the plastic wrap. Wrap and refrigerate until firm, at least 1 hour, but preferably longer. Preheat the oven to 350ºF. Line 2 baking sheets with parchment paper or a silpat liner. Remove the dough from the refrigerator and divide the dough in half. Place one half back in the refrigerator until needed. Cut the remaining half of the dough into 12 equal pieces. Working with one of the pieces at a time – cut the piece in half. Flatten each half into a thin, circle disc, just larger than the peppermint patties. If needed, use a bench scraper to handle the pieces. Place a peppermint patty on one of the circle pieces, then place the second piece of dough on top. Working quickly (as the dough will get sticky the longer you hold it) press the edges together, making sure to fully enclose the peppermint patty in the center of the cookie dough. Place the cookie on the prepared baking sheet. Continue with the rest of the dough, removing the second half of the dough from the refrigerator when needed. (If the dough gets too soft, return it to the refrigerator to firm back up.) Place the cookies 2 inches apart on the baking sheet. Bake in the preheated oven just until firm to the touch, about 15 minutes. If baking two sheets at the same time, rotate the sheets halfway through. Remove the baking sheets from the oven and allow to cool completely. Melt the chocolate at 50% in the microwave until almost melted, then stir until completely melted. (Alternately, you can melt the chocolate in a double boiler.) Use a large spoon or a fork to drizzle the chocolate over the cookies. Sprinkle with some of the crushed candy cane. Let the cookies sit until the chocolate is set up completely.